Heart failure is a condition in which the heart is no longer able to pump oxygen-rich blood to the rest of the body efficiently. This causes symptoms to occur throughout the body. Watching out for the warning signs that your heart failure is getting worse will help you catch problems before they become too serious. When watching out for warning signs, you can catch problems before they get too serious. Sometimes these simple checks will remind you that you forgot to take a pill, or that you have been drinking too much fluid or eating too much salt. Be sure to write down the results of your home self-checks so that you can share them with your health care provider. Your doctor's office may have a "telemonitor," a device you can use to send your information automatically. A nurse will go over your self-check results with you in a regular (sometimes weekly) phone call. Is my energy level normal? Am I getting more short of breath when I am doing my everyday activities? Are my clothes or shoes feeling tight? Are my ankles or legs swelling? Am I coughing more often? Does my cough sound wet? Do I get short of breath at night? These are signs that there is too much fluid building up in your body. You will need to learn how to limit your fluids and salt intake to prevent these things from happening. You will get to know what weight is right for you. Weighing yourself will help you know if there is too much fluid in your body. You might also find that your clothes and shoes are feeling tighter than normal when there is too much fluid in your body. Weigh yourself every morning on the same scale when you get up -- before you eat and after you use the bathroom. Make sure you are wearing similar clothing each time you weigh yourself. Write down your weight every day on a chart so that you can keep track of it. Call your provider if your weight goes up by more than 3 pounds (about 1.5 kilograms) in a day or 5 pounds (2 kilograms) in a week. Also call your provider if you lose a lot of weight. Know what your normal pulse rate is. Your provider will tell you what yours should be. 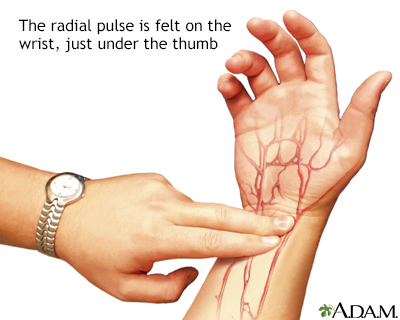 You can take your pulse in the wrist area below the base of your thumb. Use your index and third fingers of your other hand to find your pulse. Use a second hand and count the number of beats for 30 seconds. Then double that number. That is your pulse. Your provider may give you special equipment to check your heart rate. Your provider may ask you to keep track of your blood pressure at home. Make sure you get a good quality, well-fitting home device. Show it to your doctor or nurse. It will probably have a cuff with a stethoscope or a digital readout. Practice with your provider to make sure you are taking your blood pressure correctly. You are tired or weak. You feel short of breath when you are active or when you are at rest. You have shortness of breath when you lie down, or an hour or two after falling asleep. You are wheezing and having trouble breathing. You have a cough that does not go away. It may be dry and hacking, or it may sound wet and bring up pink, foamy spit. You have swelling in your feet, ankles, or legs. You have to urinate a lot, particularly at night. You have gained or lost weight. You have pain and tenderness in your belly. You have symptoms you think might be from your medicines. Your pulse or heartbeat gets very slow or very fast, or it is not regular. Your blood pressure is lower or higher than is normal for you. Eckel RH, Jakicic JM, Ard JD, et al. 2013 AHA/ACC guideline on lifestyle management to reduce cardiovascular risk: a report of the American College of Cardiology/American Heart Association Task Force on practice guidelines. J Am Coll Cardiol. 2014;63(25 Pt B):2960-2984. PMID: 2423992 www.ncbi.nlm.nih.gov/pubmed/24239922. Mann DL. Management of heart failure patients with reduced ejection fraction. In: Zipes DP, Libby P, Bonow RO, Mann DL, Tomaselli GF, Braunwald E, eds. Braunwald's Heart Disease: A Textbook of Cardiovascular Medicine. 11th ed. Philadelphia, PA: Elsevier; 2019:chap 25. Yancy CW, Jessup M, Bozkurt B, et al. 2017 ACC/AHA/HFSA Focused Update of the 2013 ACCF/AHA Guideline for the Management of Heart Failure: A Report of the American College of Cardiology/American Heart Association Task Force on Clinical Practice Guidelines and the Heart Failure Society of America. Circulation. 2017;136(6):e137-e161. PMID: 28455343 www.ncbi.nlm.nih.gov/pubmed/28455343. Zile MR, Litwin SE. Heart failure with a preserved ejection fraction. In: Zipes DP, Libby P, Bonow RO, Mann DL, Tomaselli GF, Braunwald E, eds. Braunwald's Heart Disease: A Textbook of Cardiovascular Medicine. 11th ed. Philadelphia, PA: Elsevier; 2019:chap 26.